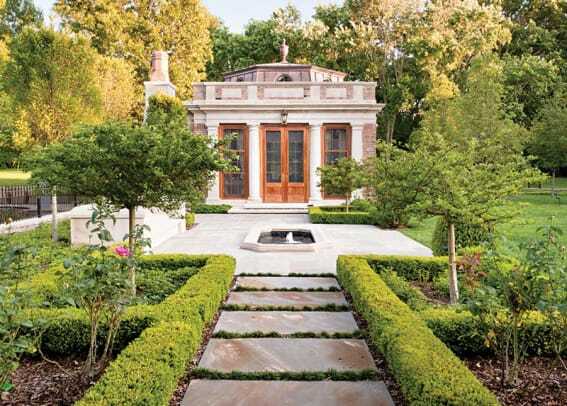 A traditional garden folly adds another dimension to an historic property in Nashville, TN. 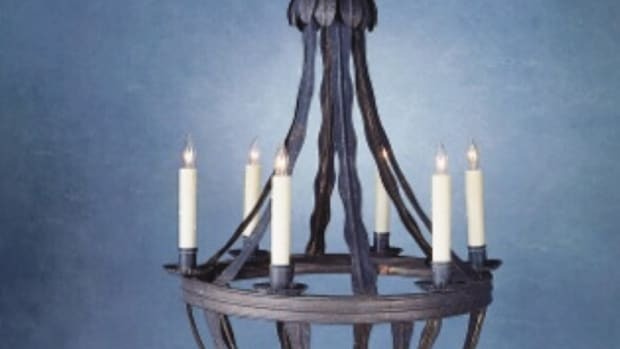 There was nothing much remarkable about the Georgian Colonial house, which had been built in Nashville’s traditional and tony Belle Meade neighborhood in the decade after World War II was history. And that is what bothered the owners, who longed for an architectural element or ornament of note on their 10-acre property. Such an addition, they reasoned, would offset their two-story, 7,000-sq.ft. house, which, through the decades before they bought it, had been extended and altered in erroneous and erratic ways. While they were searching for a solution that would bring the house up to date by perusing the past, they turned to the landscape for solace. “A folly is, by definition, an indulgent endeavor, and our greatest challenge was finding a place for restraint." Modern living for this particular family meant creating one single yet gracious space that had multiple uses: study, media room, dining room and gathering room. “It was to be a room for all seasons,” Weissmann says. “And it was to be historically accurate and somewhat whimsical in its detail.” The mission was to create a dynamic and dramatic design that looked as though it had been built centuries before the main house but that didn’t overwhelm the existing architecture. “We looked to the Southern antebellum Georgian style that’s predominant in the neighborhood,” Weissmann says. An octagonal dome literally raised the copper mansard roof off the brick, stone, metal, wood and glass folly. “This allowed the massing of the folly to be consistent with the house’s loggia while giving drama to the spaces within by visually expanding the space beyond the parapet walls,” Weissmann says. Another way Weissmann bridged the design gap was to save the formal elements for the front of the folly in homage to the house and to break the building’s perfect, square geometry in the back by allowing the fireplace and chimney to rise above the roof to satisfy code and ventilation requirements. “This way, the chimney helps the folly engage the landscape by interrupting the enclosure fence that was put up for the owners’ show dogs and by serving as a backdrop for the pear-tree espalier,” he says. The geothermal system, which supplies heat and air conditioning, has no ugly condenser in sight – it’s in the crawlspace and is accessed through a hatch door in the stone floor that’s hidden by a rug. Interior downspouts carry water through the walls, spilling it out through bronze spouts at the base, and the folly’s few electrical fixtures are bolstered by abundant natural light from clerestory windows and custom doors that create a glassed-in greenhouse effect. “It’s a piece of delight,” Wills says. “It’s a tiny, intricate building, but it has all the systems of a house but only in one room.” The fact that it’s in the middle of a garden, he adds, makes it seem as though it “grew” there from the seed of a thought. The folly, in all its glory, remains a symbol of the best architecture that history has to offer. To make sure no one forgets, Weissmann painted the bottom of the swimming pool a deeper blue so it could reflect this fact into the future. 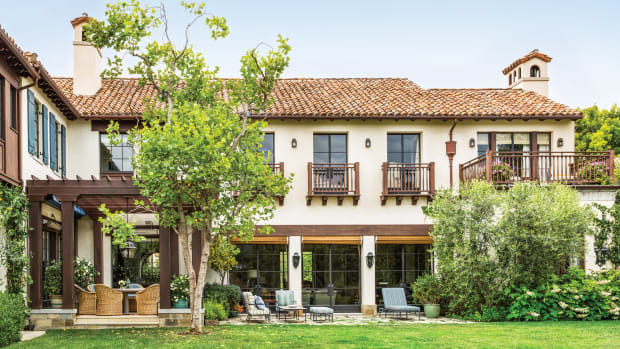 This new Mediterranean-style traditional house is large, comfortable, and characterized by a variety of interior and exterior entertaining areas that take full advantage of the water view. 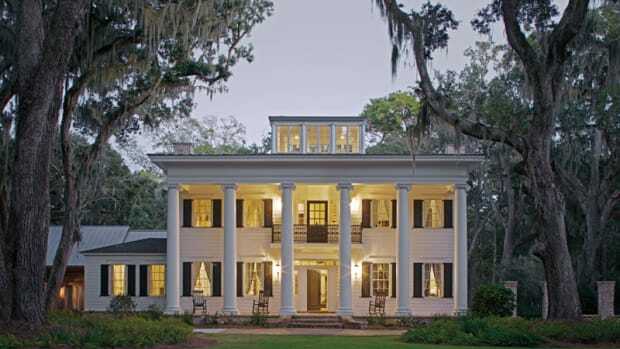 A new Greek Revival residence draws upon Southern plantation precedents.